Visit our beautiful showroom for the cheapest new and used office chairs for intensive use. Our chairs are designed for long work days. Being comfortable in your office chair breeds productive and has positive health benefits. Boca Office Chairs are the cheapest good quality chairs designed for intensive business use. 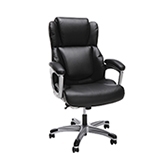 Create a comfortable work environment with a good quality new chair on sale. We have both new and used offfice chairs in stock for quick deliver and we offer delivery, set up and installation. Buy your new chair fully assembled by the pro's at Boca Office Furniture.